I guess I really like this Create a Critter cartridge. This card was created by using my Gypsy connected to my Cricut machine. I wanted to use the new hide contour feature and use my Create a Critter face stamps that I got from Peachy Keen Stamps at peachykeenstamps.com. You'll see that I only used the eyes stamp on the Hippo's face because I have a lot to learn about pre-planning. I also just got the "Lots of Pun" stamp set from joyslife.com. That's where the cute little "Hi-ppopotamus" saying came from. These stamps are very cute and worth every penny. AWWW!!! 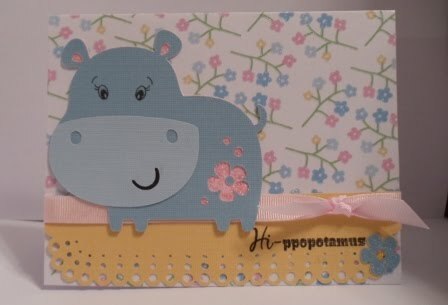 Your hippo card is sooo cute!!! The stamp is so happy living on that card! ;) I'm so glad you're enjoying the stamps. Thank you for using them and letting me take a look at your great work!